Rye (Secale cereale) is also a grass. 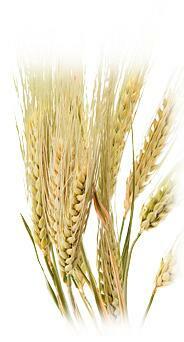 It is popular in Eastern, Central and Northern Europe and less important as a grain crop in other parts of the world. Compared to wheat rye is longer and more slender and varies in colour from yellowish brown to greyish green. Cultivated rye is believed to have originated from S. montanum, a wild species found in southern Europe and nearby parts of Asia. Rye was found as a weed widely distributed in wheat and barley fields in southern Asia. It apparently had coevolved with wheat and barley for over 2,000 years until its value as a crop was recognized. Rye is grown primarily in Eastern, Central and Northern Europe. The Russian Federation (3,910,290 MT), Poland and Germany are leading in the production of rye (2007). Rye is far more tolerant to poor growing conditions than wheat, and it grows in soil of low quality where other grains will not. In addition, rye is able to withstand prolonged and submersion in water as well as drought. Rye used for traditional breads, particularly those from Eastern Europe and Russia, including pumpernickel. Rye is also used to make the familiar crisp bread. Furthermore some whiskies and vodkas are made with rye.